20 August, 2018, Moga: First of its own kind, a Gurbani based nature oasis has been created by Washington based EcoSikh in Punjab. Guru Nanak Bagh(garden) was inaugurated on August 20, 2018, by EcoSikh in collaboration with the citizens of Patto Hira Singh village and the Patto Eco Tree and Landscape Society (PETALS). 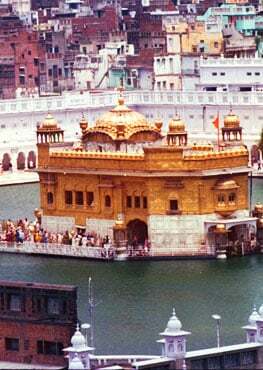 This project was launched in celebrations of 550th birth-anniversary of Guru Nanak to be celebrated worldwide in 2019. Various species of trees mentioned in the Sikh scriptures, Guru Granth Sahib, has been planted at this five-acre site. This historical sacred spot in Moga has been visited by Guru Nanak Dev ji and by the Sixth, Seventh and the tenth Sikh Gurus as mentioned in history. Supreet Kaur, EcoSikh India President, said, "We wanted to choose a site which is linked with Guru Nanak and secondly we were excited that the local community was enthusiastic about this unique project. This is perhaps the first time that 13 different tree species mentioned in Gurbani have been planted in one garden or one site. Over 400 tree of 13 species from gurbani like; mango, neem, kikkar, simal, bamboo, jujube, henna, date palms, bohar, sandalwood etc. were planted by volunteers." 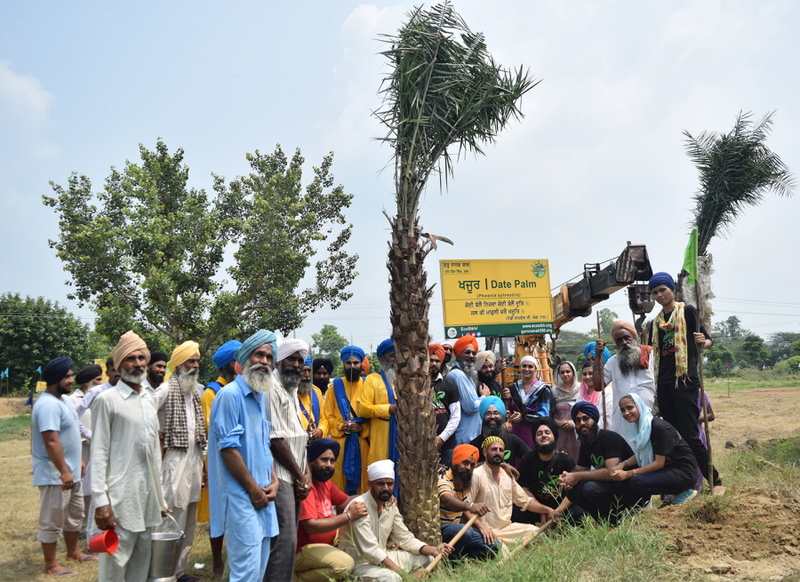 Jaspreet Singh, Secretary of EcoSikh, said, "This project is dedicated to the 550th birth-anniversary of Guru Nanak Dev ji and has been facilitated under the campaign "550 Trees in the Name of Guru alias 550 Rukh Guru de Naam". He added, "Every tree has been identified with a corresponding line from Guru Granth Sahib. The credit for the entire research and the organization of this project goes to landscape expert, Dr. Balwinder Singh Lakhewali. We are also grateful to all the EcoSikh volunteers and the citizens of Patto Hira Singh for their sense of dedication and their commitment to preserve nature." Dr. Rajwant Singh, EcoSikh International President, said, "We want to highlight teachings of Guru Nanak on nature and this is the best way to exhibit the close connection of Sikh spirituality with God's creation. 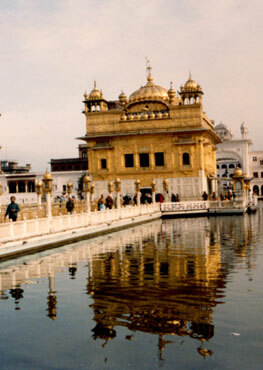 We are confident that this will inspire not only people of Punjab and India but people all over the world." Expressing his feelings, the PETALS President, Sukhchain Singh said, "We are thankful to EcoSikh for envisioning that Guru Nanak's 550th birth-anniversary should be celebrated with having a long lasting positive impact. Planting trees from Gurbani in the name of Guru is a win-win situation for people, earth, animals and nature. It is history being created." Secretary Jagtar Singh and treasurer Ajmer Singh from Patto Eco Tree and Landscape Society shared that previously on March 14, 2012 the project for environmental protection and preservation was initiated by the Patto Hira Singh citizens and the volunteers of PETALS on the 13 acres of land under the supervision of Dr. Jaswinder Singh Bilga. 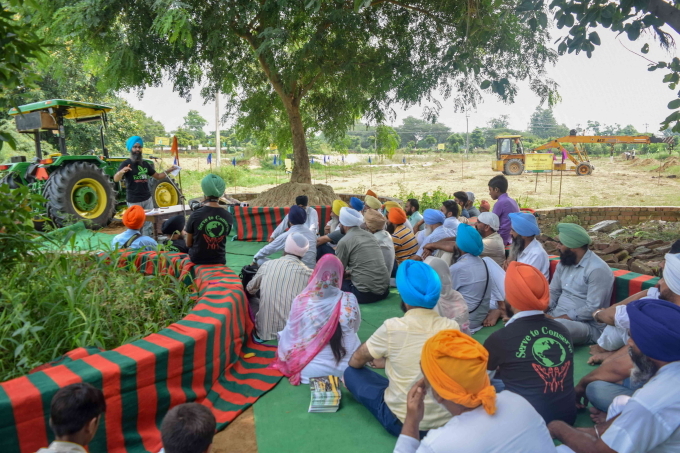 In response to a call given to all Sikhs by EcoSikh to plant 550 trees at 1820 location with the goal of planting 1 million trees all over the world, various teams have joined in many cities and villages in Punjab and they have started their own plantations. EcoSikh is a response from the Sikh community to the threats of climate change and the deterioration of the natural environment. Our organization arose as part of the Long Term Plans for Generational Change programme initiated in 2009 by the United Nations Development Programme (UNDP) and the Alliance of Religions and Conservation, UK (ARC) to help the world’s major religious traditions create long-term plan to improve their relationship with the environment and to guide their investment towards environmental protection.